Ok, it’s really not BUT I know we all are wishing for warmer weather, no matter where we live! Even though it doesn’t feel like spring, all stores and brands are bringing out their spring wear so I thought I would show you how to style one of my favorite new spring tops, TWO different ways. 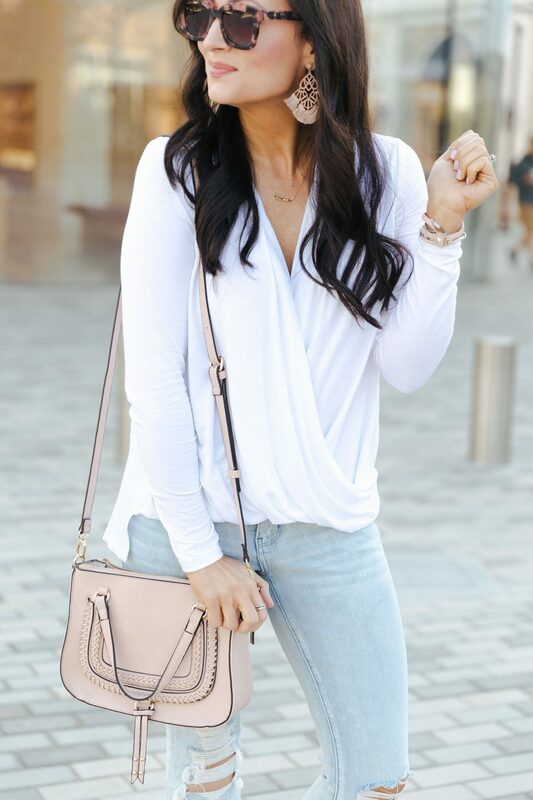 Whether you are styling this adorable (and the most flattering) white top or a plain white tee in your closet, make sure you save this post for a little inspiration on how to wear a simple basic multiple different ways. 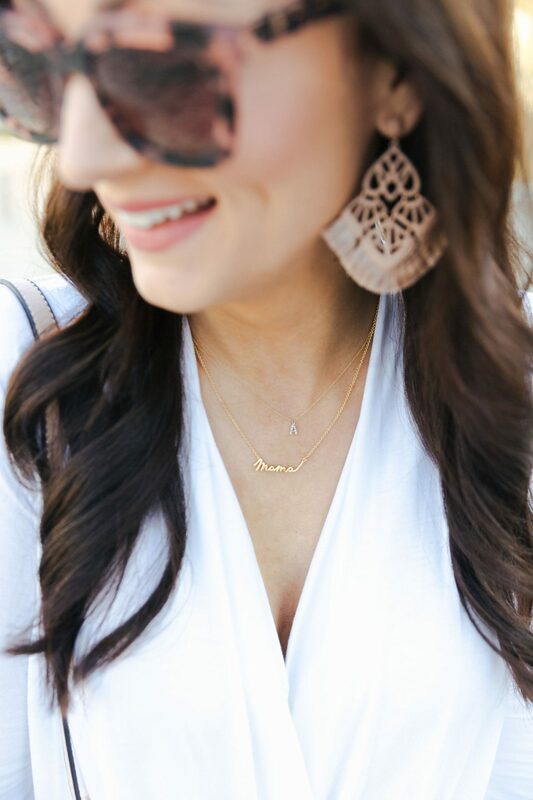 I can’t get enough of this dainty little Mama necklace! Perfect for layering and makes a great gift for any mama in your life. (Comes in silver too). Leopard Block Heels (If between sizes, size 1/2 up). I love that you can take a simple white blouse, add a fun patterned or colored heel and be ready for a girl’s night out OR add a blazer and be ready for the workplace. I can’t rave about this drapey white top enough as it’s SO flattering on everyone, it’s not too low cut (which is what I was worried about before I got it), and it’s the perfect lightweight fabric as we transition into spring. (It also comes in black – You better believe after wearing the white on repeat, the black was a MUST for me). Let’s also take a second and talk about these leopard block heels. Aren’t they SO FUN?! 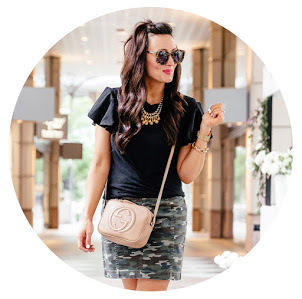 One of my favorite ways to style an outfit is to add a fun heel for a pop of style. This leopard pair can be worn with SO many things in your closet plus, they are currently 50% off and under $50! A black dress, black denim, jeans, a chambray dress, a white spring dress….you name it, these leopard heels will be the perfect match. Field Jacket (Mine is last season but similar styles are HERE & HERE). Look #2 is one of my favorite looks that I’ve shot so far. Probably because it’s so realistic and anyone can wear it! 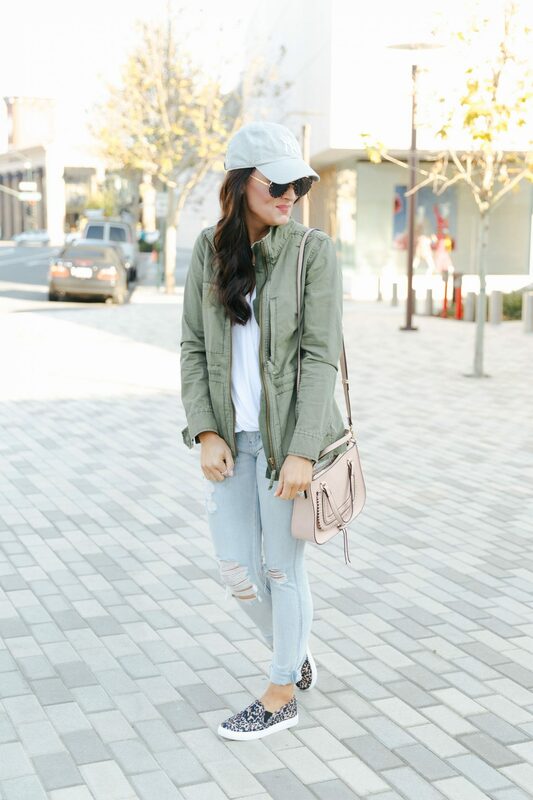 I swapped out the leopard heels for a slip on leopard sneaker and I added an army green utility jacket to make it into a more casual weekend look. 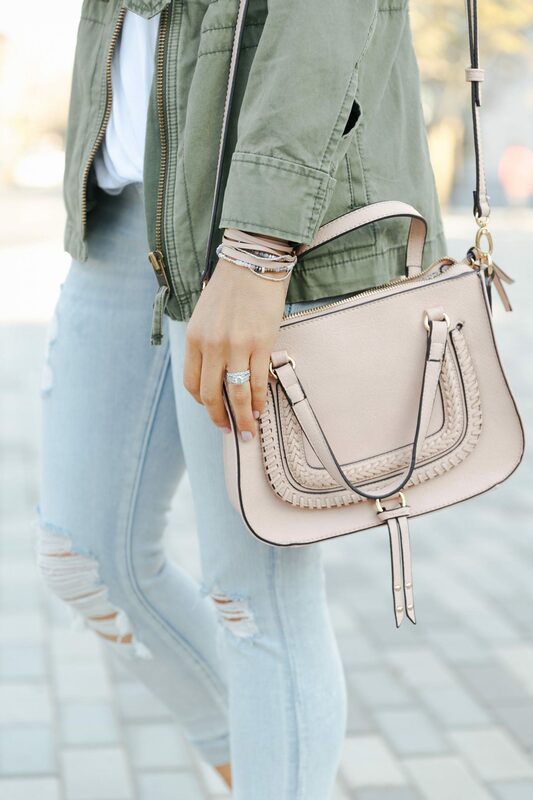 Add a few different accessories, plus a layer or two and you’ve got multiple looks! TIP: When I travel, this is how I think about outfits. What pieces can I wear multiple ways?! Those versatile pieces get packed with me on my trips and it makes getting dressed while traveling a breeze. I hope this post helps give you some outfit inspiration as we step into spring. PS. HOW does sweet little Eloise turn ONE tomorrow?! HOW is that even possible.